After leaving Gothenburg on 12 December in the snow, I spent a warm day exploring and eating my way through Singapore on the way to Christchurch, New Zealand and then a few days getting over the jetlag in New Zealand summer. On 17 December it was time to return to Christchurch and meet up with Johan, the technician who is helping me with the moorings on the cruise. We spent the next day shopping for a few bits of equipment that had appeared on the list after the container had left for New Zealand in early October. If anybody should require a chandlery or hardware store in Christchurch I can probably point them into the right direction. On 19 December we went to the port in Lyttelton and said hello to Araon who had come into port. Almost all our equipment was on the quayside next to the ship – apart from the mooring anchors that should have been delivered from Wellington that day. The agent assured us that they were probably on their way and we went off to buy last minute supplies like snacks and flour for the bread maker etc. 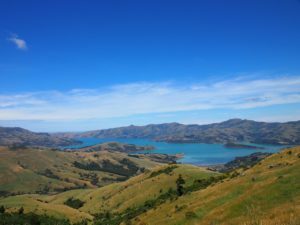 Pre-cruise summer in New Zealand: The Banks Peninsula near Christchurch. Loading the equipment that was on the quayside and finding space for it on board went very smoothly the next day and we were finished by lunchtime. But still no mooring anchors. A phone call to the very helpful technician at the New Zealand Institute for Water and Atmospheric Research (NIWA) who had organized the anchor weights for us told us that the weights were still in Wellington. She managed to impress on the freight company that the anchor weights needed to be with us in Lyttelton the next day and things started to finally move on the tracker app. We were scheduled to leave on 21 December at 14.00 and after delivering the rental car back to the airport in the morning, Johan and I took a taxi to Araon. At 11.00 the tracker app told me that the anchor weights had made it to the Christchurch depot of the freight company. A phone call to check when they were being delivered turned out be rather essential after it turned out they weren’t to be delivered until the next day. After the phone call they were practically on their way and did make it just in time. 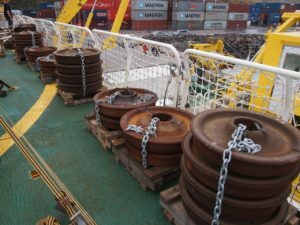 The first mooring line for the ship was let go as soon as the last weight touched the deck. And we were on our way! The mooring anchors on the helicopter deck of Araon. Note the linesmen on the quayside waiting to let go the mooring lines. So why were we so anxious about 5 tons of old train wheels? The driver delivering the weights did wonder, as might you. Are you going to sink them? Essentially that is what we are going to do. 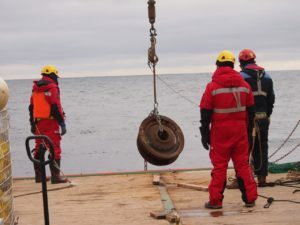 The strings of moored instruments that we are going to deploy have buoys to hold them upright in the water column and to give us data at different depths and so they need something heavy at the bottom to anchor them to the same spot, until we come back two years or so later to release them. The moment just before dropping the mooring anchor. Photo from a deployment on the 2015/16 Araon cruise to the Amundsen Sea. 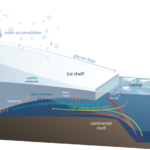 The Amundsen Sea is a long way from anywhere – part of the reason why it remained unexplored until relatively recently. Our first mooring was scheduled for day 16 of the cruise and we settled into life on board, doing bits of preparation, other work, going to the gym, meeting our shipmates for the cruise and getting the on-board bakery, i.e., the bread maker going. A Christmas tree appeared in the hallway and we had a party on Christmas Eve to mark the occasion. Sea and weather were kind to us, so the sailing was smooth and it felt more like a cruise to the sub-tropics. 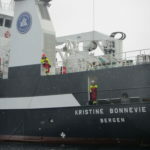 This was partly due to the fact that the ship was going east to the Udintsev Fracture Zone to retrieve three moorings that had been deployed there on the last cuise and to do a hydrographic survey. Fracture zones are gaps in the sub-sea ridges that run across the abyssal planes of the world oceans. 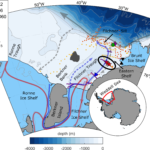 The Udintsev Fracture Zone steers the Antarctic Circumpolar Current that encircles the Antarctic continent southward and is thought to be one of the reasons why warmer water reaches the ice shelves in the Amundsen and Bellingshausen Seas. After recovering two of three moorings and shaking out a few teething problems in the sampling equipment on board, we started to head south towards the Amundsen Sea and as it started to snow things were looking distinctly more polar. 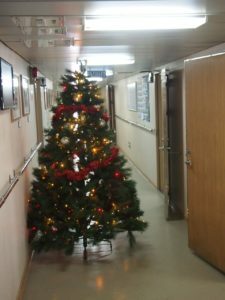 The Christmas tree in the corridor on the main deck. Note for next year: Always tie your Christmas tree to something so it doesn’t fall over in high waves. ← Live (but delayed) reports from Araon and the Amundsen Sea!